Explore aristocratic palaces, find a hidden iconic statue or discover the oldest pharmacy in the town! You can experience all of this on Panska Street. Bratislava experienced one of its best times in the 18th century, during the reign of Maria Theresa. 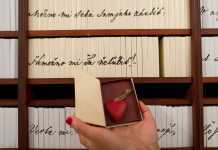 She was very fond of our city and frequently visited it from nearby Vienna. During that time, the Hungarian aristocracy built many luxurious palaces in Bratislava, to be close to her during her visits. 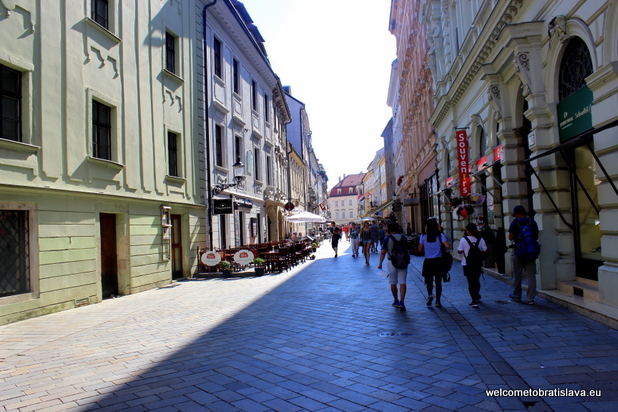 Therefore there are several impressive aristocratic buildings standing on one of the streets of the Old Town, accurately called Panská Street (translated as Aristocracy Street). It used to be one of the best addresses in town for higher society. There are five beautiful palaces standing on the Panská Street. All of them vary in their architectural styles. Let’s start with the Esterhazy Palace from 1743. Admire its baroque facade with a monumental gate with an arc celebrating one of the most important Hungarian families, Esterhazy. The architecture of this building strongly reflects the Viennese architectural influence represented mostly by Johann B. Fischer. On the right side, next to the Esterhazy Palace, at the address Panská 15, you can admire the Balass Palace from 1762. It beautifully shows how the architecture style changed in a 20-year period and how the subtle but impressive rococo replaced the pompous baroque style. Do notice its elegant allegorical statues on its facade, depicting human virtues – judgement, moderation, justice and courage. The Keglevich Palace is a baroque mansion on Panská 27. It is one of the city’s cultural real estate monuments. They built it on the remains of the gothic and renaissance masonry from the previous buildings. Count Joseph Keglevich built this mansion, however, he was not its most famous occupant. It was a certain Anna Louise Barbara Keglevich, also called Babette, who was given private lessons by Ludwig van Beethoven in Vienna and Bratislava. Beethoven even composed a few sonatas dedicated to her and performed concerts at the Keglevich Palace! The floor plan of the palace has a distinctive U-shape. Do notice a beautiful facade with lion statues and coat of arms of Count Joseph Keglevich – it has a red base with two silver stripes and two golden lions holding a sword with a golden hilt on the blue background which runs into the crown with nine pearls, a symbol of countship. The second crown with nine pearls stands on the top of the coat of arms. The Csáky Palace from 1775 stands on Panská 33. 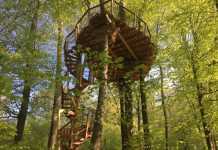 It is a National Cultural Monument of the Slovak Republic. 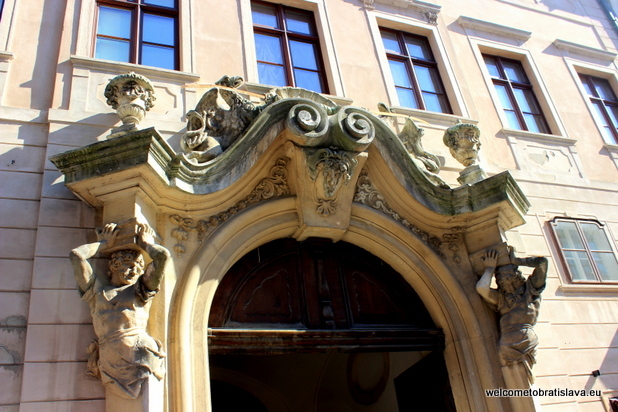 The Palffy Palace standing on Panská 19 has a beautiful facade in a classical style. It hides one of the oldest architectural landmarks in the city. The oldest layer discovered under the palace is at least 2000 years old and dates back to the period of the first Bratislava’s inhabitants – Celts. The palace itself is a medieval building but contains 700-year old masonry from the 13th century together with the Roman bricks. The palace also has many gothic elements, mostly windows and portals. It currently houses the The Bratislava City Gallery. The numerous palaces are not the only sight you should notice when walking down this street. There is a funny little figure hidden at the facade of one of the houses called Posmievačik (the mocking man). Look for the optician shop called Fokus (it is the building number 29). Look up and you will see a small funny naked man hiding there in a hole. Rumour has it that this man was set there to ridicule a former owner of the building who used to spy on the passers through a small window. Corporis Christi Chapel stands at Panská 11 and does not look like a church building at all. Its premises are part of the baroque-classical house. The current chapel from 1775 replaced the original chapel from 1396 which was destroyed during the rebellions against the Habsburg monarchy. The current facade contains an embossment depicting Resurrection with a long inscription and Coat of Arms of Archbishop John Telegdy who sponsored the rebuilding works. Another impressive building is a former Salvator’s apothecary at Panská 35. It is the oldest pharmacy in Bratislava established in 1904 by the pharmacist Rudolf Adler. It has survived all the regimes since the monarchy, through the first republic and during the socialism but was unfortunately shut down in 1995 and has remained closed since then. Therefore you can admire it only from the outside. Its facade contains several architectural styles including the late gothic, renaissance and baroque elements. The most dominant object is a statue of Christ the Saviour by the popular sculptor Alojz Rigele. 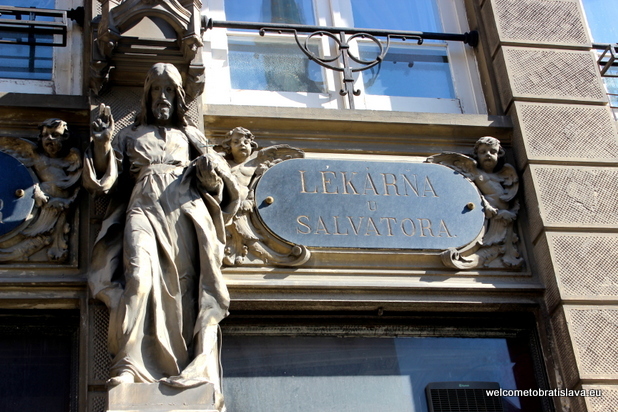 You can see three different names of the pharmacy on the building – in Slovak, German and Hungarian language. 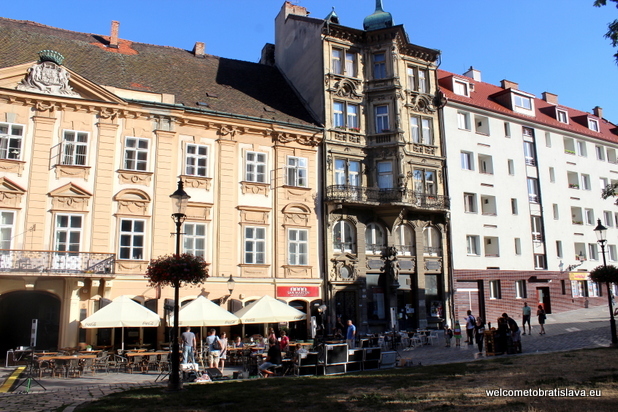 The Panská Street connects at one end with the beautiful Rudnay Square. It is a place where one of the city gates used to stand – Vydricka Gate. This gate has not been preserved up till now and the only reminder are the few blocks on the corner house. 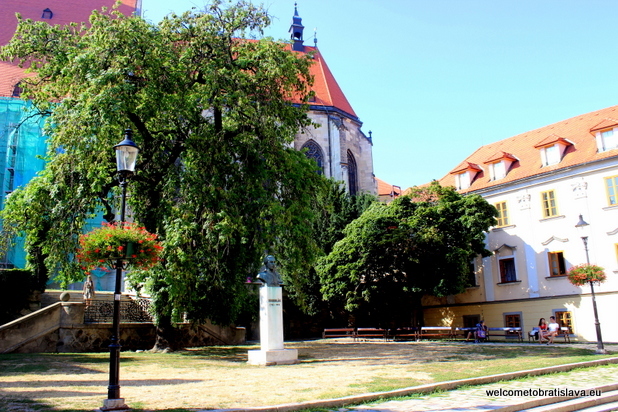 From the Rudnay Square, you can easily reach the St. Martin’s Cathedral from its southern side. Admire the beautiful small Rudnay Square which is very popular for its unique atmosphere. We love how the park area around the church connects with the street where you can find many restaurants and cafes. It is a truly enjoyable spot to sit down and have a drink or two. 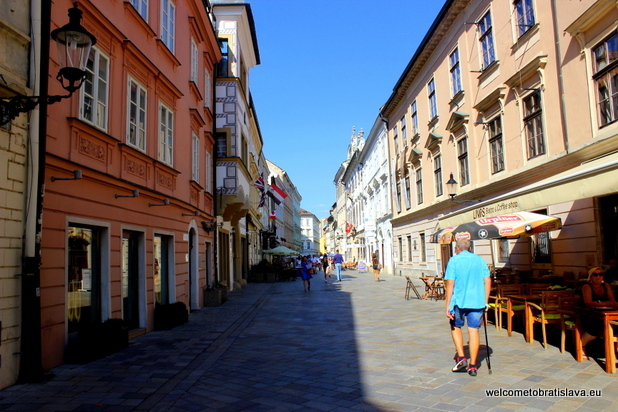 Panska is a lively street in the heart of Old Town and therefore full of places to enjoy good coffee, excellent meals, beer or wine. These are some of our favourite ones! 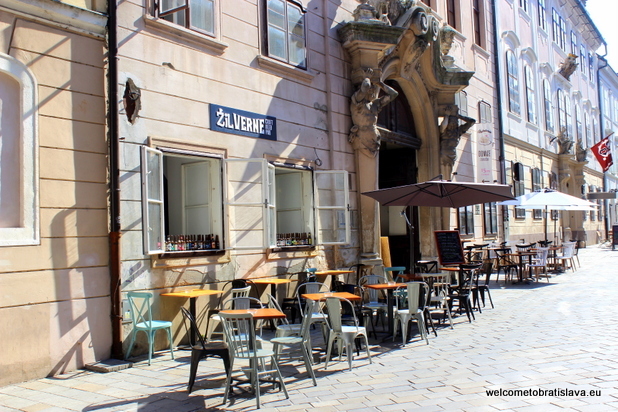 Žil Verne is a cool beer pub inspired by a famous writer Jules Verne. Minibar by Spin is a tiny bar with a concept based on regularly changing signature cocktails and shots ideal for crazy party nights. Another bar tip is the Baudelaire Evil Flowers Bar with creative literary concept and excellent drinks. Five points is a hip coffee place which serves nice breakfast, excellent coffee and cakes. NiceFries offers amazing street food meals with fries which made it to our list of top street food places in Bratislava. Mondieu is a very popular café serving healthy meals, vegan options and the best sweets ever! Gatto Matto with its Italian cuisine will satisfy hungry passersby. We have a soft spot for San Marten with its summer terrace, great wine selection and tasty food. 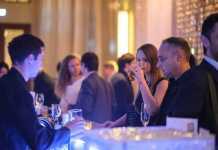 It also made it to our list of the best wine places.